One of the earlier and still popular techniques is the surgical removal of the undesirable pigmentation by slicing technique using scalpel or Kirkland's gingivectomy knife. Each technique had its own supremacy in efficiency and also draw back. Hence in the present study, an attempt was made by comparing radiofrequency and Conventional (slicing) technique for gingival de-pigmentation clinically. A total of 4 subjects with gingival pigmentation who are willing for the procedure were selected. Patient aged between 15-30 years were included. The facial gingival units of #11,#12,#13,#14 and #21,#22,#23,#24 were selected for surgical procedure. Patient suffering from long term systemic illness, genetic pigmentary disorders and smokers were excluded. A complete medical history and investigations for blood and urine were carried out to rule out any systemic contraindications for the surgery. Distribution of melanin pigmentation in gingiva was recorded in relation to each gingival unit comprising of interdental papilla with half marginal gingival on either side of it and associated attached gingiva in every patient before procedure. 3 - Diffuse Continuous Pigmentation (brown/black/any pigmented colour). The score added and divided by the number of gingival unit examined to get the mean pigmentation score of surgical site and subjected to comparison. A total of 28 gingival units from 4 cases selected and the gingival units were made plaque free and clinically healthy before attempting for surgical procedure. Under perfectly aseptic conditions and infiltration anesthesia, the gingiva of the facial surface of the selected sites were de-epithelialized by conventional (slicing) method (14 gingival units of 21,22,23,24) using No 15 surgical blade [Figure 1] and by radiofrequency (14 gingival units of 11, 12, 13, 14) [Figure 2] respectively. The entire visible pigmentation was removed, exposing the underlying connective tissue [Figure 3]. 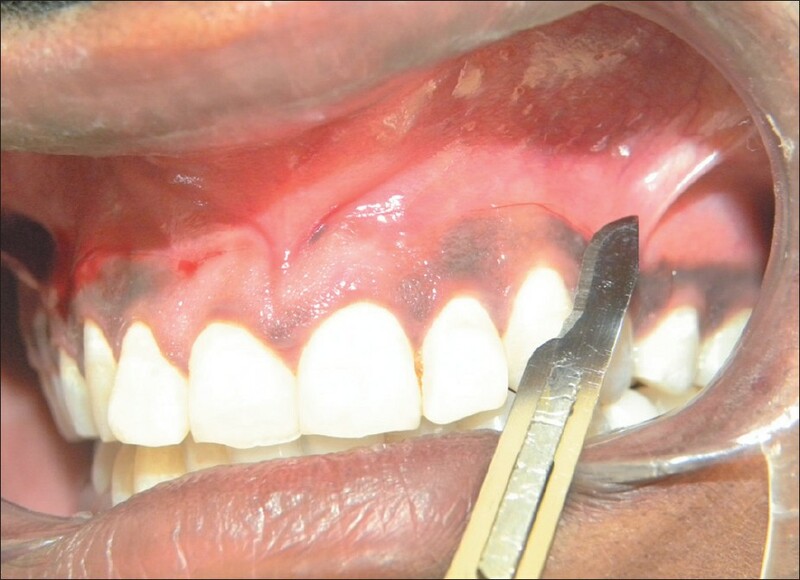 After thorough depigmentation, the surgical site was dressed with periodontal pack [Figure 4]. Patients were discharged with proper post-operative instructions, and adequate antibiotic and analgesic coverage. The patients were recalled after one week for pack removal and observed on 30 th , 60 th and 90 th days [Figure 5] for recurrence of melanin pigment in the depigmented site and scored accordingly, to evaluate the efficacy between the two methods used. Out of 28 gingival units of four cases, 14 were treated with radiofrequency and another 14 units by conventional slicing method. The total pre-operative gingival score was 33 [Table 1] and mean gingival pigmentation score of gingival units that were operated by with radiofrequency and conventional (slicing) method was 2.34 and 2.39 respectively [Table 1]. On re-evaluation of cases for the recurrence of pigment in the depigmented sites operated by radiofrequency [Table 2] on 30 th , 60 th and 90 th days, revealed the mean pigment recurrence score per gingival unit was 0.14 on 30 th day, 0.36 on 60 th day and 0.42 on 90 th day respectively. whereas, sites operated with conventional (slicing) method [Table 2] showed higher mean pigment recurrence score which is of 0.5 on 30 th day, 1.0 on 60 th day and 1.3 on 90 th day respectively. In the present study, 28 gingival units of maxillary component from 4 cases were selected. Out of 28 gingival units 14 gingival units were operated with radiofrequency and another 14 gingival units with conventional slicing method. Following surgical procedure, patients were recalled after 30 th , 60 th and 90 th days respectively to observe the recurrence of pigments. On observation, the mean recurrence pigment score in sites operated by radiofrequency was 0.14 on 30 th day, 0.36 on 60 th day and 0.42 on 90 th day. In contrary, the mean recurrence pigment score in the sites operated with conventional slicing method was 0.5 on 30 th day, 1.0 on 60 th day and 1.3 on 90 th day respectively. Comparison of the obtained data indicated that rate of recurrence in the sites operated with conventional slicing method was higher, than the sites treated with radiofrequency. A reasonable explanation can be given, regarding the superior efficiency of radio ablation when compared to conventional slicing method in the present study, based on Oringer (1975)  exploding cell theory. According to this theory, we can hypothesize that the electrically generated thermal energy influenced the molecular disintegration of melanin cells that are present on the basal and supra basal cell layer of operated gingival sites. And the latent heat of radiosurgery had some influence on retarding the development and migration of melanocytes, which makes use of radiofrequency more efficient in surgical depigmentation procedure compared to conventional procedures. If radiofrequency is used judiciously, it can be valuable clinically as a safe and effective method for depigmentation, in conjunction with esthetic dentistry. 1. Dummet CO. Oral tissue color changes. Ala J Med Sci 1979;16:274-83. 2. Hirschfeld I, Hirschfeld L. Oral pigmentation and a method of removing it. Oral Surg Oral Med Oral Pathol 1951;4:1012-6. 3. Farnoosh AA. Treatment of gingival pigmentation and discoloration for esthetic purposes. Int J Periodont Restor Dent 1990;10:313-8. 4. Mokeem SA. Management of gingival hyperpigmentation by surgical abrasion: Report of 3 cases. Saudi Dent J 2006;18:161-6. 5. 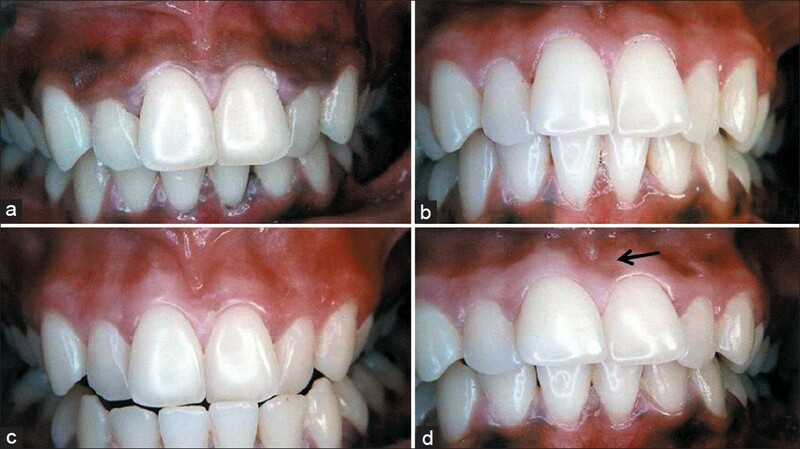 Perlmutter S, Tal H. Repigmentation of the gingiva following surgical injury. J Periodontol 1986;57:48-50. 6. Dummett CO, Bolden TE. Post surgical clinical repigmentation of the gingivae. J Oral Surg Oral Med Oral Pathol 1963;16:353-65. 7. Tamizi M, Taheri M. Treatment of severe physiologic gingival pigmentation with free gingival autograft. Quintessence Int 1996;27:555-8. 8. 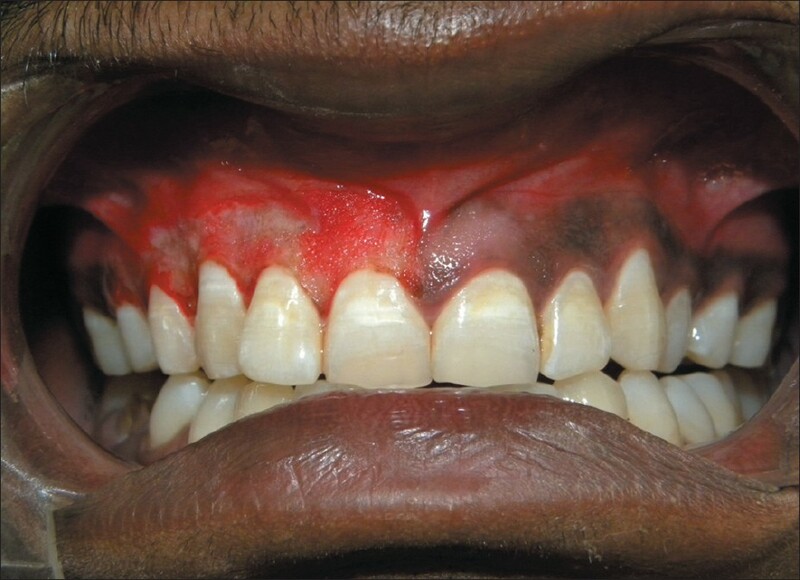 Deepak P, Sunil S, Mishra R, Sheshadri Treatment of gingival pigmentation- A case series. Indian J Dent Res 2005;16:171-6. 9. Tal H, Landsberg J, Kozlovsky A. Cryosurgical depigmentation of the gingival. A case report. J Clin Periodontol 1987;14:614-7. 10. Atsawasuwan P, Greethong K, Nimmanon V. Treatment of gingival hyperpigmentation for esthetic purposes by Nd: YAG laser: Report of 4 cases. J Periodontol 2000;71:315-21. 11. Berk G, Atici K, Berk N. Treatment of gingival pigmentation with Er, Cr: YSGG Laser. J Oral Laser Appl 2005;5:249-51. 12. Kaur H, Jain S, Sharma RL. Duration of reappearance of gingival melanin pigmentation after surgical removal - A clinical study. J Indian Soc Periodontol 2010;14:101-5. 13. Pal TK, Dhodapkar SV, Mehta DS, Kapoor KK. A new surgical procedure for removing gingival melanin pigmentation. West Bengal State Dent J 1984;2:9-13. 14. Begamaschi O, Kon S, Doine AI, Ruben MP. Melanin repigmentation after gingivectomy: A five year clinical and transmission Electron Microscopic Study in Humans. Int J Periodont Restor Dent 1993;13:85-92. 15. Ginwalla TM, Gomes BC, Varma BR. Surgical removal of gingival pigmentation. J Indian Dent Assoc 1966;38:147-50. 16. Oringer MJ. Electro surgery in Dentistry. 2 nd ed. Philadelphia: W.B. Saunder Co.; 1975.